Keywords: motorised ankle dorsiflexion; venous leg ulcers; leg oedema; ulcer recurrence; venous insufficiency. Compression therapy is the standard treatment for patients with venous leg ulcers. 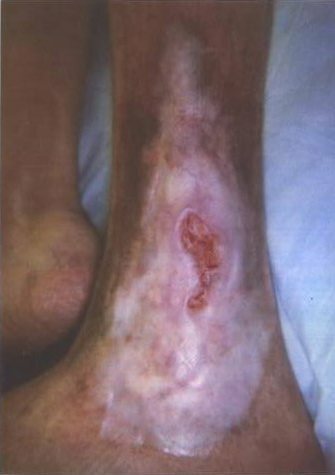 Venous leg ulcers have a high recurrence rate. 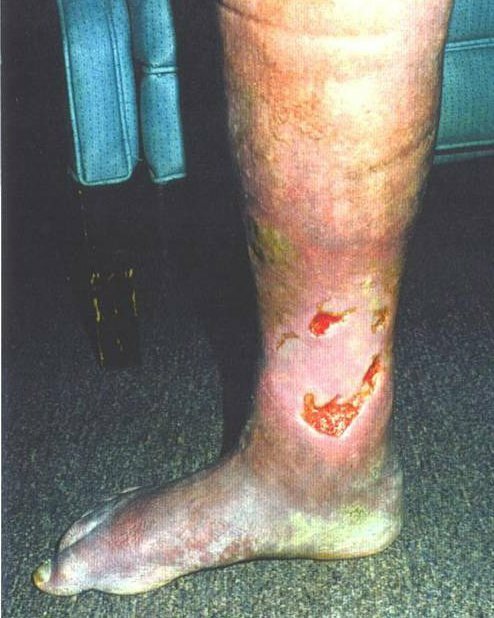 Additional therapies may be required to treat hard-to-heal venous leg ulcers. Motorised ankle dorsiflexion can be used to exercise the calf muscle pump to encourage venous blood flow in patients with venous insufficiency. In this short report, the manufacturers describe how a motorised pump may be used as an adjunctive treatment in the management of hard-to-heal venous leg ulcers. Ankle dorsiflexion passively flexes the ankle, resulting in a backward movement of the foot and turning the toes upwards. This helps to activate the calf muscle pump, which plays an important role in propelling blood away from the lower leg towards the heart . The process of dorsiflexion stretches the calf muscle, which results in a contraction of the posterior compartment. This increases the pressure within the vein, opens the superior one-way valve and forces the venous blood upwards. The impact of ankle dorsiflexion can be demonstrated by venography, which shows how venous blood in the lower limb is pumped rhythmically with such movement. This can also help to reduce oedema of the lower leg ,  and promote healing. 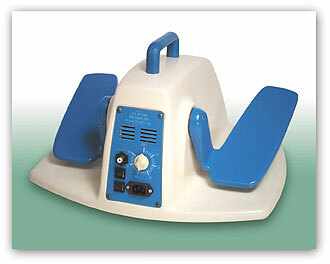 The motorised pump (Figure 1) has a pair of paddles that dorsiflex the feet and simulate walking. It is used mainly in older people with leg oedema, venous leg ulceration and stasis dermatitis secondary to chronic venous insufficiency. Ideally it should be used 3-5 times a day, for 30 minutes each time. Ongoing use is recommended to help prevent ulcer recurrence. The following case reports show how motorised ankle dorsiflexion can be used in the management of patients with venous leg ulcers. David (aged 68) has a 30-year history of venous ulceration in the lower right leg. 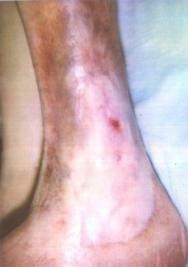 He was diagnosed with chronic venous insufficiency with leg oedema, stasis dermatitis and varicosities. He is also obese and has type 2 diabetes (controlled by diet and combination treatment with a sulphonylurea and metformin) and hypertension. Further medication includes diuretics, which David takes intermittently. Management of his venous ulcers had included the use of compression stockings, leg elevation and Unna boots (gauze dressing around the foot and leg). Compression therapy had also been used but had been stopped because of poor compliance at home. Four years previously healing had been achieved using Unna boots and the sustained use of compression stockings had been advised to prevent recurrence. 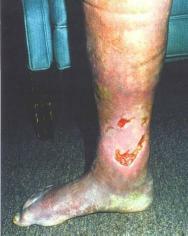 Several months later David had recurrence of his leg ulcer. He was admitted to hospital and started on treatment with compression therapy. Once the ulcers had healed he was discharged home. 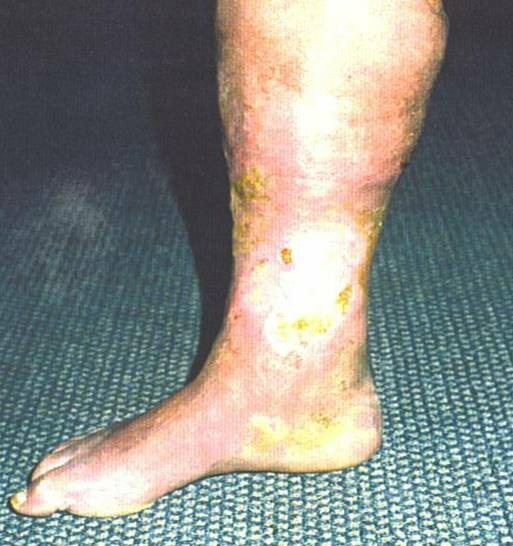 Four weeks later he stopped wearing the compression stockings, his legs became swollen and the ulcers recurred. At this point he felt frustrated and refused further treatment. After living with continuous leg ulceration for another four years (Figure 2), David consented to motorised ankle dorsiflexion, using the motorised pump at home 3-5 times a day for 15-30 minutes each time. 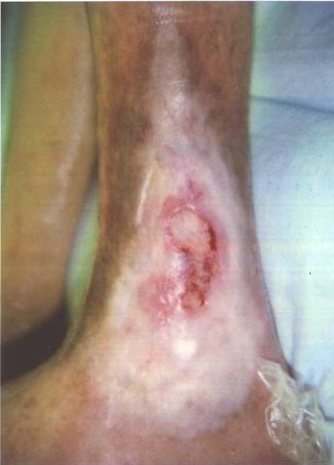 The ulcers were covered with an alginate dressing and semi-permeable foam, held in place with light compression stockings. Regular use of the motorised pump resulted in almost complete wound closure and a significant reduction in oedema after six weeks (Figure 3). During this time David elected not to take diuretics as the oedema had reduced and his blood pressure had returned to a normal level. David did not continue to use the motorised pump regularly once the ulcers had healed, despite being advised to do so. Light compression stockings were insufficient to control the oedema. He experienced severe pain, with oedema in both legs, and the ulcers on his right leg recurred. After consideration he agreed to further treatment using motorised ankle dorsiflexion in addition to treatment with Unna boots. Healing was achieved within three weeks. Since then David has used the motorised pump at least twice a day for 15-30 minutes each time. To prevent ulcer recurrence it is recommended that he continue to use motorised ankle dorsiflexion. He also continues to use compression stockings. Deidre, 87, was diagnosed with chronic venous insufficiency and stasis dermatitis. On presentation she had venous ulcers on her left leg (Figure 4). Deidre was first treated for venous leg ulcers in 1997. 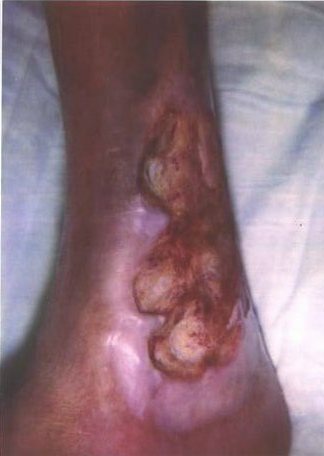 Over the next two years the ulcers gradually reduced in size after surgical debridement, and weekly cleansing with mild soap and water and the application of a hydrophyllic wound dressing (usually a primary dressing with a zinc-based filler that provides a moist environment conducive to wound healing). In January 1999 healing stalled, despite the use of compression therapy and antibiotics for a possible wound infection. (Figure 5). There were no signs of improvement after six months and it was decided to start home treatment with motorised ankle dorsiflexion for 20-30 minutes, 3-5 times a day. Weekly wound cleansing and dressing changes continued. The ulcer showed some sign of improvement a month later (Figure 6), with almost complete wound closure achieved after 10 weeks (Figure 7). The patient has continued to use the motorised pump for about 30 minutes three times a day. Her leg ulcers have not recurred. Motorised ankle dorsiflexion may be an effective treatment when used in conjunction with other treatments such as compression therapy, leg elevation and Unna Boots. It has been shown to help relieve oedema and promote healing in venous leg ulcers and stasis dermatitis. However, further research is needed to confirm these initial case findings. 1. Araki CT, Back TL, Thompson PN, Jamil Z, et al. The significance of calf muscle pump function in venous ulceration. J Vasc Surg 1994; 20(6): 872-79. 2. Garcia MC, Cheverette JC. The case for dorsiflexion. Diabetic Foot 2002; 5(3): 156. 3. Staubesand J, Heisterkamp JC, Stege H. Use of duplex sonography to investigate the effect of active and passive movement at the ankle joint for promoting venous return. Clin Anat 1995; 8(2): 96-101.